PESCO represents manufacturers offering product lines including uninterrupted power systems (UPS), power distribution units (PDU), remote power panels (RPP), static switches, as well as overhead busway systems which can provide clients with a complete turnkey solution for data centers and computer lab applications. We also offer products that help to provide better power quality including UPS systems, harmonic filters, surge protection, and power factor correction capacitors. PESCO has successfully introduced UPS systems into hospitals, colleges and universities, pharmaceutical companies, investment firms, and municipalities. We are always sourcing new products and manufacturers. Contact us about any product/brand you are seeking. 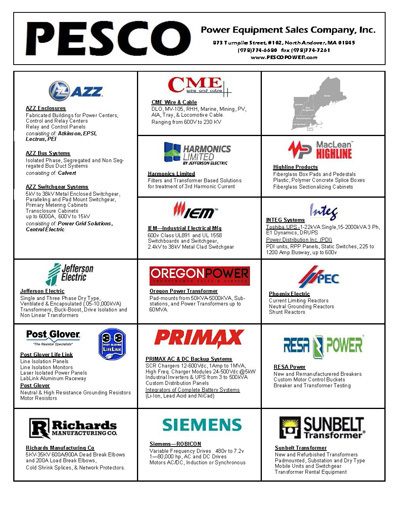 To learn more about he manufacturers and the lines we currently represent, please view our current Line Card.